The Rice & Rose Law Firm was the primary sponsor of Plan B Cycling's team for the annual MS 150 Cycle to the Shore fundraising ride on the weekend of October 1, 2011. The Rice & Rose/Plan B team had 85 bicyclists who participated in a total field of approximately 2000 riders. Plan B Cycling along with their sponsors and participants have raised over $100,000.00 for the MS Society. 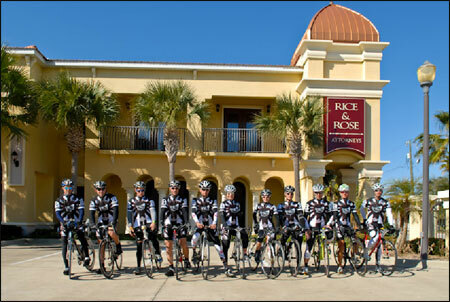 This is the third straight year that Rice & Rose has sponsored the annual weekend event where cyclists ride from St. Augustine, Florida to Daytona Beach, Florida on Saturday and back to St. Augustine on Sunday. Multiple Sclerosis is a chronic, often disabling disease that attacks the central nervous system including the brain, spinal cord and optic nerves. Its symptons may be mild, such as numbness in the limbs, or severe, such as paralysis or loss of vision. The National MS Society addresses the challenges of each person affected by MS by funding cutting-edge research, driving change through advocacy, facilitating professional education and providing programs and services designed to help people with MS and their families move their lives forward.